(Omnibuses, Street Cars, Buses, Railroads, etc.) in Norwood, Ohio. The history of Norwood is tied strongly to the various means of transportation throughout the years. At first, it was the pioneers traveling by foot on the forest paths to their lands. For years it was not safe for the settlers to go to the properties they had purchased. After the threat of Indian attacks was over, the pioneers would travel from settlements on the Ohio River, at Columbia (near today's Lunken Airport) and Losantiville (later renamed Cincinnati) to the as yet unnamed wilderness of Norwood, as well as other places north of the river and the hills. The path from Columbia, as it goes through Norwood, is followed by today's Edwards Road, Edmondson Road, Smith Road and Carthage Avenue. The trail from Cincinnati is marked by today's Montgomery Road. Connections to other early communities were also by paths probably first used by animals and then Indians. Duck Creek Road, which followed along a stream of that name, may have been such a trail, connecting early Norwood with Madisonville. Early documents referred to Montgomery Road as the "State road" and Columbia Road as the "County road." These early roads, especially after they were improved so they could be used by wagons and coaches, provided a reasonable method of travel between Norwood (or as it was called then — Sharpsburg) and Cincinnati and other nearby communities. However, the roads were not adequate to spur growth and, basically, just a few farmers lived in the area. For a list of the railroad stations over the years, CLICK HERE. The transformation of Sharpsburg from a farming community to a village was started with the railroads. First, the Marietta & Cincinnati Railroad cut through Sharpsburg, from east to west, on its way from Loveland, at the Little Miami River, to Cincinnati, using the Mill Creek as its final route. This railroad started in 1845 as the Belpre & Cincinnati Railroad Company. It was renamed the Marietta & Cincinnati in 1851. As the M. & C., it went from near Marietta, Ohio, to Cincinnati, with its final leg from Loveland, being on the Little Miami Railroad's tracks, starting in 1857. Although various sources give different dates for the opening of the tracks through Norwood, it appears that the line was built sometime in the 1860's - possibly starting in 1863, after capital was raised with the help of European investors, and completed in early 1866. A jury to determine compensation for the condemed Loveland land of G. H. Lounsburg for the M. & C.'s use was called in late September 1864. A June 1865 article states that in January 1864, the grading and masonry work from Loveland to Cincinnati had been placed under contract. The line located in 1860 with some minor modification was to be used. A February 19, 1866, story said "Today, it (the Marietta & Cincinnati Railroad) is independent ... For nearly nine years past the company have paid to the Little Miami Railroad Company a rental of $75,000 per annum for the privilege of using their tracks between this city (Cincinnati) and Loveland. Now they have their own tracks, and are free to come and go as they please. The first passenger train over the new line, from Loveland to Cincinnati, arrived yesterday morning at two minutes after seven o'clock." The stations listed on the new route did not include Sharpsburg. Madisonville and Ludlow Grove, on either side of Sharpsburg were listed. Interestingly, between those two stations, Walnut Hills and Avondale stations were given. In the book "The suburbs of Cincinnati: sketches, historical and descriptive," 1870, by Sidney D. Maxwell, the following information was included: "Avondale Station, eleven miles from the Cincinnati depot, was at the crossing of the Reading or Lebanon turnpike. Here is the St. Aloysius Orphan Asylum, but there is yet no suburban improvement nearer than the well-known village of this name, some distance to the southward. One mUe farther out is Norwood, on the Montgomery pike. Formerly this was called Sharpsburg. In 1869 a valuable addition was laid out in large lots, and the avenues graded north of the old village. Since then the name of the postoffice has been changed to Norwood.Oakley, one mile east of Norwood, on the Madisonville turnpike, is about three years old, and is already a suburb of considerable importance. There have been subdivisions on both sides of the railroad, and about fifty good residences erected." The Lane Library's Historical Collection web site's B&O Timeline (available in Adobe® pdf format or Microsoft® Excel® xls format) lists the construction of the M&C line from Loveland to Ludlow Grove (Spring Grove/Winton Place) as 1861 (the CH&D rails were used as the final leg to downtown) with completion of the M&C's own tracks from Ludlow Grove to Cincinnati in 1864. The Lane site's source reference was B&O History by Stover. The year when the railroad starting running through what was then Sharpsburg is important, because passenger railroad access to Cincinnati may have been a major factor in the decision to plat the Norwood Heights subdivision in 1869. As it is, either 1863-1866 is close enough to persuade the developers to consider creating that subdivision. In 1883, the railroad became the Cincinnati, Washington & Baltimore. At the end of 1889, the Baltimore & Ohio R. R. completely took over the C., W. & B. and renamed it the Baltimore & Ohio Southwestern (B. & O. SW.) R. R. Other name and ownership changes occurred since then: C. & O. in 1963, Amtrak in 1971, Chessie in 1973, and CSX in 1980. Soon after the tracks were running through Sharpsburg, landowners started platting subdivisions. In 1868, just to the north of the tracks, on either side of Montgomery Pike, two early developments were the Baker Subdivision on the west, and Langdon's Subdivision of Sharpsburg on the east. At Langdon's the first railroad station, the Sharpsburg Station, was built. Within a year, the Norwood Heights Subdivision of Parvin, Bolles, and Lane, was platted. From this first use of the name "Norwood," the settlement of Sharpsburg would soon be renamed Norwood. At that time the Sharpsburg station was replaced with two stations named after the new subdivisions — Norwood to the west and East Norwood to the east. The first developments were premature, however, and the properties, especially Norwood Heights, were slow to sell. It took another railroad to finally get people to recognize the potential of the area. In 1874, the Miami Valley Narrow Gauge Railway Company was incorporated to provide Lebanon with a railroad connection. Two years later the name was shortened to the Miami Valley Railway and plans were made to lay a narrow gauge track from Xenia to Cincinnati. The railroad acquired right-of-way and even broke ground at Eden Park in the fall of 1876, but went into bankruptcy two and one-half years later. In early 1880, it was acquired by the Toledo, Delphos and Burlington Railroad and reorganized as the Cincinnati-Northern Railway Company. The Cincinnati-Northern laid narrow gauge tracks from northeast to southwest through Norwood. The first part of the route was finished from the town of Dodds, 6 miles north of Lebanon, to East Norwood. By 1881 (construction was completed by May 10, 1881), traffic was running between East Norwood and Lebanon, Ohio, and in 1882 (completed by March 1, 1882), service to the Court Street Station (about where the bus station is located today) in downtown Cincinnati was opened by use of a tunnel, which still exists just east of I-71 from near Bethesda Hospital to near McMillan Street. Originally the tunnel accomodated dual narrow-gauge tracks, until the conversion to a single standard-gauge track. It was about this time that developers started another push to build subdivisions in Norwood, e.g. East Norwood and Ivanhoe. Trying to overcome financial problems, in 1881, the parent company, T.,D.&B. merged with a subsidiary, the Toledo, Cincinnati and St. Louis (T.,C.&StL.) and took that name. In early spring of 1883, the Cincinnati-Northern and the Spring Grove, Avondale and Cincinnati Railway merged into the T.,C.&StL. Some maps of that time identify the line through Norwood as the T.,C.&StL. The mergers did not save the company, however, and the various routes were sold. The Cincinnati to Dodds route was reorganized as the Cincinnati, Lebanon & Northern on June 27, 1885. Workers and business owners could see the advantage of living in the countryside and working in the city, when a rapid system of commuting by train was available. The C., L. & N. line was a more direct route to downtown than the C., W. & B. The railroad advertised that the travel time from Norwood was "less than 20 minutes," which was probably correct for the southernmost Norwood Station — Idlewild. However, the trip from the East Norwood Station was likely just around 25 minutes. Still, not a bad commute, even by today's standards. The growth of the many Norwood subdivisions around the C., L. & N. tracks caused several passenger stations to be built. They were, from south to north: Idlewild, Ivanhoe, Hopkins, Norwood Park (or Smith Road) and East Norwood. If the same distances between these stations was maintained, there should have been a station at Highland and Beech Avenues. If the land around there had developed residential instead of commercial, perhaps a station would have been placed there. The commuters often called the railroad by the nickname "The Northern." In 1887, the railroad acquired another nickname—"The Highland Route," as it was the only usable tracks into Cincinnati during the flood. This name was justified again in 1913, when it was the only rail transport into flooded Dayton, Ohio, and during the 1937 Cincinnati flood. On September 16, 1894, the entire track of the C., L. & N. switched from narrow gauge to standard gauge, thus allowing freight traffic to easily connect from other lines. In 1896, the Pennsylvania Railroad purchased the C., L. & N. R. R., and in 1923, the railroad was consolidated into the Pennsylvania Railroad's Pennsylvania, Ohio & Detroit Railroad Company. A 1953 newspaper article said that in 1903, the C., L. & N. supplied most of the commuter trains to downtown Cincinnati. It continued by saying that the fare was only 5¢ and the trip took only 17 minutes. With Clay Rockwell the main Norwood agent at the Norwood Park station, Smith Road and Lafayette Avenue, the company had these other stations in Norwood: Ivanhoe, at Ivanhoe & Williams; Hopkins, Ashland & Montgomery, and East Norwood, Forest & Harris. Fifteen trains a day ran the route that year. In 1933, passenger service was routed along the B. & O. 's lines to the new Union Terminal. So, after fifty years, only freight traffic traveled along the South Norwood tracks. The passenger stations on that section of C. L. & N. track were abandoned, and only one building still remains—the Ivanhoe Avenue Station, which was used as a gas station and is now used as a chiropractor's office. In the 1980's, the tracks in Norwood from Idlewild (Evanston) to the B.&O. tracks near Harris and Forest Avenue were removed. In 1986, the Indiana & Ohio Railroad acquired parts of the old line, including the remaining tracks in Norwood (tracks from B.&O. line at the East Norwood Station to, and including, the McCullough Yard at the Lester Road Station; the right-of-way of the old line was acquired by OKI or the bus company). In 1996, RailTex, of Texas, acquired the Indiana & Ohio Railroad. In late 1999, RailAmerica acquired RailTex and the Indiana & Ohio became a RailAmerica subsidiary. To the south, another railroad was laying tracks. In 1882 the Cincinnati and Eastern Railroad was traveling from Cincinnati's Court Street Depot at Court and Gilbert Streets, along the C., L. & N. rails to Idlewild. From there using its own tracks, it traveled to the Elsmere Station, Mornington Station (at what was to be later renamed Hyde Park) then along Wasson Avenue to the east. This railroad was probably instrumental in the early development of the Elsmere Subdivision and perhaps the Cleneay's Sunnyside Subdivision, especially until the electric street car line was built on Montgomery Road. The name of the "Eastern" changed to the Ohio and Northwestern Railroad, the Cincinnati, Portsmouth and Virigina Railroad and then the Norfork & Western Railroad . It eventually became part of the Pennsylvania Railroad. Some of its knicknames were "The Eastern," the Eastern "Jerkwater," the "dinkey," the "Coats, Pants and Vest" and "The Pocahontas Route." Although the commuter trains appeared to supply the growing population a fast and reliable means of transportation, the people wanted more. Even before the Village of Norwood was incorporated, there was an organized effort to extend, or at least connect to, the Kerper's Cable Railway to Norwood. The talk turned to modern methods of street cars and in February, 1888, a meeting of Norwood citizens and property holders was held to discuss the need to build an electric road on Montgomery Pike from Kerper's road to Norwood. Even the county commissioners would get involved. Kerper's Cable, also called the Walnut Hills Cable Road, ran from the Post Office in downtown Cincinnati, traveled on Walnut Street, McMillan Street, Woodburn Avenue and ended on Montgomery Pike, just north of the Gilbert Avenue-Woodburn Avenue-Montgomery Pike intersection, near the United Jewish Cemetery, south of Duck Creek Road. Click here for a newspaper clipping about the extension of the Walnut Hills Cable road in the summer of 1888. Early Norwood residents, who for one reason or another, could not or did not ride the trains would walk Montgomery Road to and from the station at that intersection. For a very short time (about a week) in 1888, an omnibus (horse-drawn wagon) transported people between Norwood and the cable car depot. It was discontinued because the fare from the limited ridership was not enough to pay the Montgomery Pike toll. Because of legal arguments about the ownership of the Montgomery Road right-of-way, it was not until July 4, 1891, that the first cars ran on the Norwood electric road. The cars ran between Sanker's Inn in Norwood to Walnut Hills and Eden Park, turning at the top of the Mr. Adams Incline. In March 1892, the State of Ohio passed a law allowing the County Commisioners of Hamilton County the right to purchase all or part of the Cincinnati and Montgomery turnpike for the purpose of making it a free and public road. Norwood — This car left from Fourth and John, traveling on John, Fifth, Broadway, Gilbert and Main (Montgomery Road) Avenues to the B. & O. S.W. R.R. crossing in Norwood. It returned the same route, except it continued on Broadway pass Fifth to Fourth, and then John Street. The round trip time was one hour and thirty minutes. The route also ran all-night cars to Blair Avenue, Walnut Hills. It may have become Route 5, Norwood. Vine Street-Norwood — This route went from Fourth and Vine, on Vine, McMillan, Gilbert Avenue and Montgomery Road to the Baltimore, Ohio and Southwestern crossing in Norwood. It returned on Montgomery Road, Gilbert, McMillan, Vine, Fifth, Walnut and Fourth to Vine Street. The round trip time was one hour and forty minutes. It may have become Route 9, Vine-Norwood. Edwards Road Branch — This route was ran from Erie Avenue to the Oakley Race Course, next to Norwood. Passengers could transfer to and from the Madison Avenue route to get downtown. Its route number may have been 67. Eventually more routes would run through or to Norwood, e.g. Routes 4, 5, 7, 8, 9 and 70 (Note: the routes shown in the linked pages are from ca. mid-1920's and may differ over the years). In 1949 (1950 for Route 7), the electric street cars were replaced by trolley buses, using the same overhead double electric lines. By 1965 or earlier the trolley buses were replaced by diesel buses. In 2004, several bus routes serving Norwood were abandoned with only Routes 4 (downtown route) and 51 (crosstown route) remaining. The Norwood and Redbank Belt Line Traction Company was organized at Cincinnati in November 1903. 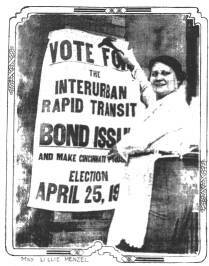 When what is now referred to as the "Cincinnati Subway" was proposed, it was to travel through Norwood. This photograph from an April 1916 newspaper shows that there was support along the route. The lady, Mrs. Lillie Menzel, had a business on Edwards Road.